(Newser) – Famed defense attorney F. Lee Bailey, whose legion of high-profile cases includes the OJ Simpson murder trial, has filed for bankruptcy in Maine in an effort to discharge an IRS debt of more than $5 million, the AP reports. Debts to the IRS aren't normally discharged in bankruptcy proceedings, but the 83-year-old Bailey said Friday that they can be if one abides by certain conditions, such as filing and paying his taxes on time since the original taxes and penalties were assessed. The debt stems from a dispute of his reportable income from 1993 to 2001, according to the Portland Press Herald. 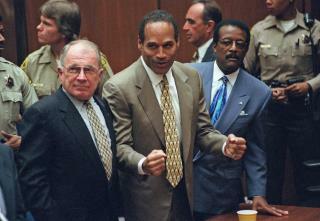 Bailey served as one of Simpson's attorneys during the former NFL star's 1995 trial, which ended in his acquittal in the 1994 murders of his ex-wife, Nicole Brown Simpson, and her friend Ronald Goldman. Beware the fake IRS telemarketing calls! We've received a couple, and the caller had a very East Indian/Pakistani accent. We had fun jerking them around, but they persist. The one I'm waiting for next is going to come from F. Lee Bailey's office, it seems. Bailey should have to file for an appeal to get off death row for letting a murderer walk.